Locally installed on your computer. Accessible from the cloud. Tailored to the Service Specific tools for different services including mowing, landscaping/hardscaping, chemical applications, and snow plowing, each created to be easy to understand and easy to use. Automatic Rescheduling Schedule it once, and never touch it again. Even set specific dates you want the frequency to change (ex. changing from weekly to biweekly in June). Dynamic Scheduling Set days between jobs and never worry if you’ll cut a lawn twice in 4 days as you’re catching up from the rain. This keeps your mind sane and the customer’s happy. Job Costing Know your profit margin on each job you do. Employee Efficiency See the productivity of each employee. Work Projections Know expected revenue for next week, next month, or next year. Custom Reporting Export pre-defined reports to excel, or build your own from scratch! Organized information See past services, present status, and future jobs at a glance. Add customized fields to pull reports from, and edit services easily. Automatic Reminders Set-up reminders to yourself, others in the office, or crew members to upsell, call back, bring extra mulch, etc. History of Contact Keep an organized history of all the contact you have with a customer, and attach files straight to their account! Mass Emailing Automatically send out pre and post service notifications before and/or after you do a job. Internal Billing Everything you need to send out invoices, record payments and know your numbers, all in the same program. Sync with QuickBooks You don’t have to use us! Link to QuickBooks Desktop seamlessly, without double entries. Record Work From the field, just press start and stop to record times. No spending hours deciphering handwriting recording the information manually. Edit Work Keep your guys up to date without the hassle of contacting them by making adjustments on the go. 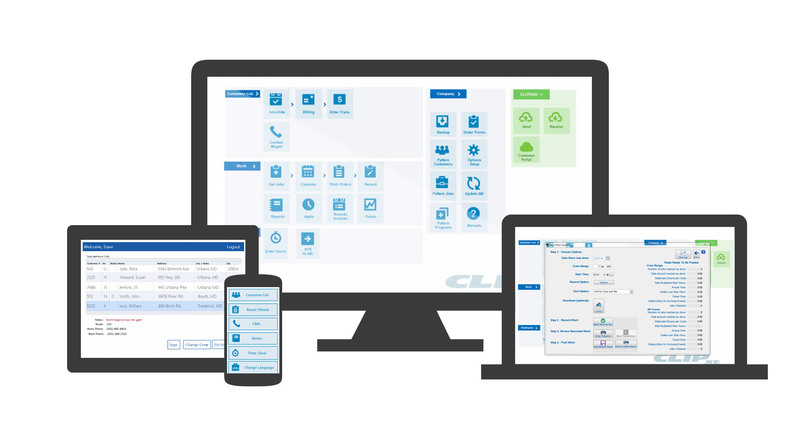 Manage Customers The customer interface is designed for convenience and efficiency. You can view, and edit current customers, add new jobs, or even new customers. Save Office Time At the end of the day all you do is download the work, review it and finalize! *Unlimited Usernames, one license means one person can be logged in at a time. © 2014 Sensible Software Inc. All rights reserved.